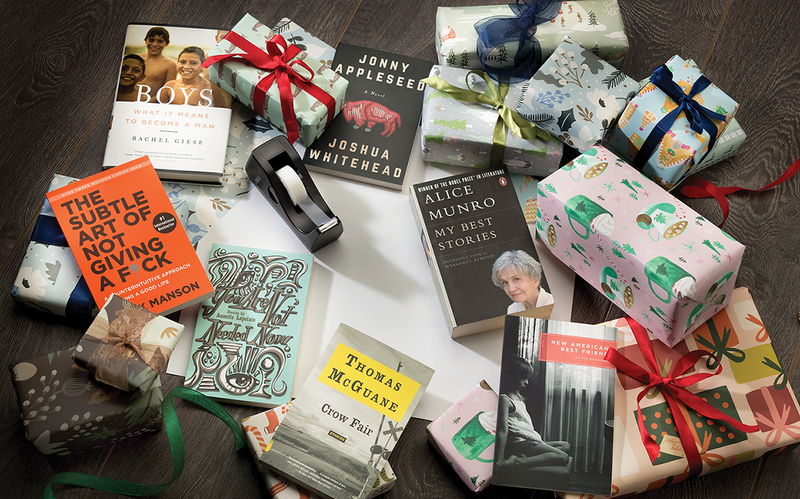 Seven local writers recommend these books as great gift ideas. With an easy, candid tone reminiscent of good friends chatting over coffee, Rachel Giese takes readers on an insightful, balanced journey in Boys: What it Means to Become a Man. Giese uses case studies, research, anecdotes, history and interviews to explore the concept of masculinity, and what it means to be a boy in today’s world. Natasha Deen writes for kids and teens, and she loves mixing mystery, action and creepy with a whole lot of humour. I loved the The Subtle Art of Not Giving a F*ck by Mark Manson because it reminded me to stop caring about everything. That might sound counter-intuitive, but we don’t have time to focus on needless things – especially online posts and comments. It has helped me immensely to not focus on things that truly don’t matter. Jason hosts the Jason Gregor Show on TSN 1260 and writes for Oilersnation and the Edmonton Journal. This year I picked up an extremely strange new short-story collection, Annette Lapointe’s You Are Not Needed Now. It doesn’t ask much – sound, clear writing that’s easy to move through, no long commitments to long stories – but it still delivers stories so compelling and weird that I keep thinking about them, wishing I’d written them myself. Jennifer Quist is a novelist, critic and graduate student at the University of Alberta. Her latest novel, set in Edmonton, is The Apocalypse of Morgan Turner. The cowboy-philosopher of the American West is 78 years old and in his twilight, but Thomas McGuane’s latest collection of new short fiction, Crow Fair, is a late-career opus. His characters are at war with themselves, living in a crumbling, lonely West that’s at war with itself, too. It all makes for some seriously spellbinding storytelling. Robbie Jeffrey is an Edmonton-based writer whose journalism has appeared in Eighteen Bridges, Avenue and Alberta Views. Jonny Appleseed, the debut novel of author Joshua Whitehead, tells the tale of a young, two-spirit queer Indigenous man who moves from a Manitoban rez into the big city of Winnipeg. The book is non-linear and tells us a collection of stories from Jonny’s life on and off the rez. It is dark and funny, dream-like and true, all at the same time. Alexis Kienlen is an agricultural journalist, freelance writer and the author of two books of poetry and a biography. Her debut novel is expected in Spring 2020. Let’s not forget about Alice Munro, whom everyone was talking about in 2013 when she won the Nobel Prize for Literature. My Best Stories contains some of her own favourites, and her early works tackled how difficult it is for women to have relationships of any kind. This collection takes us from the world of young girls to the losses that accompany old age. Terese Brasen writes fiction and non-fiction and is the author of the novel, Kama. New American Best Friend is Olivia Gatwood’s unapologetic examination of being young, female and fearlessly alive in both of those identities. Her poems swim through her experiences with the world around her – the places she calls home, the people in her life, the impulses of girls – brought together in a collection for readers of all ages to pour themselves into. Nisha Patel is an Indo-Canadian poet and artist. She has published a collection of poems called Water and a solo chapbook, Limited Success, through Glass Buffalo Publishing. She is currently working on a debut full collection of poetry.